Definition at line 51 of file LogTags.h. Definition at line 55 of file LogTags.h. References c_str(), isTcpHit(), and update(). Definition at line 56 of file LogTags.cc. 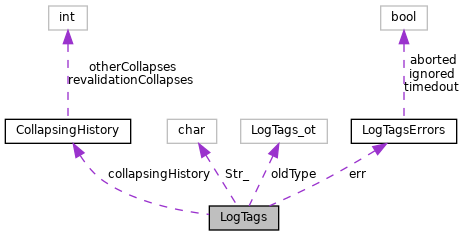 References LogTags::Errors::aborted, assert, buf, CollapsingHistory::collapsed(), collapsingHistory, err, LogTags::Errors::ignored, LOG_TYPE_MAX, oldType, Str_, and LogTags::Errors::timedout. Referenced by Format::Format::assemble(), Log::Format::HttpdCombined(), Log::Format::HttpdCommon(), ClientHttpRequest::httpStart(), LogTags(), clientReplyContext::processMiss(), Log::Format::SquidNative(), and statClientRequests(). Definition at line 91 of file LogTags.cc. References LOG_TCP_HIT, LOG_TCP_IMS_HIT, LOG_TCP_INM_HIT, LOG_TCP_MEM_HIT, LOG_TCP_NEGATIVE_HIT, LOG_TCP_OFFLINE_HIT, LOG_TCP_REFRESH_FAIL_OLD, LOG_TCP_REFRESH_UNMODIFIED, and oldType. Referenced by Http::Stream::buildRangeHeader(), clientReplyContext::buildReplyHeader(), clientdbUpdate(), clientUpdateStatCounters(), LogTags(), and clientReplyContext::sendMoreData(). Definition at line 44 of file LogTags.cc. References assert, debugs, LOG_TYPE_MAX, oldType, and Str_. Referenced by clientReplyContext::cacheHit(), clientGetMoreData(), clientReplyContext::handleIMSReply(), htcpLogHtcp(), ClientHttpRequest::httpStart(), clientReplyContext::identifyFoundObject(), LogTags(), clientReplyContext::processConditional(), clientReplyContext::processExpired(), clientReplyContext::processMiss(), clientReplyContext::processReplyAccessResult(), clientReplyContext::purgeDoMissPurge(), clientReplyContext::purgeFoundObject(), clientReplyContext::purgeRequest(), clientReplyContext::sendBodyTooLargeError(), clientReplyContext::sendNotModified(), clientReplyContext::sendPreconditionFailedError(), TunnelStateData::tunnelEstablishmentDone(), and tunnelStartShoveling(). Definition at line 86 of file LogTags.h. Referenced by c_str(), clientLifetimeTimeout(), clientReplyContext::handleIMSReply(), and Http::Stream::noteIoError(). Definition at line 84 of file LogTags.h. Referenced by clientReplyContext::buildReplyHeader(), c_str(), clientReplyContext::cacheHit(), clientdbUpdate(), clientUpdateStatCounters(), clientUpdateStatHistCounters(), clientReplyContext::doGetMoreData(), isTcpHit(), clientReplyContext::processReplyAccess(), and update(). Definition at line 79 of file LogTags.h. Referenced by c_str(), and update().